New Meteor Shower Tonight: Will Bad Weather Spoil the Celestial Show? A new meteor shower, the Camelopardalids, will make their first night sky appearance on May 23 and 24, 2014. Created by the Comet 209P/LINEAR, the meteors will appear to radiate out from the constellation Camelopardalis (Camel Leopard, or Giraffe). If you're hoping to get a view of tonight’s (May 23) highly anticipated new meteor shower, the weather will be the biggest factor. For skywatchers in the United States, the north-central part of the nation will have the best weather for viewing shooting stars. A large dome of high pressure centered north of Chicago will likely deliver mostly clear skies with excellent viewing prospects for tonight's predicted Camelopardalid meteor shower to much of the Great Lakes region, as well as the Greater Ohio Valley as far east as the mid-Atlantic coast. A rare meteor storm, or especially intense meteor shower, could happen if a particular comet was active hundreds of years ago. See how meteor storms work in this Space.com infographic. Across the Deep South, the Central Great Plains and Texas and Oklahoma, a stationary weather front will generate showers and scattered thunderstorms as well as a swath of mid-to-high level cloudiness. A small wave of low pressure adjacent to the coast of North Carolina might produce cloudiness as well as a few localized showers and thunderstorms across parts of both North and South Carolina. Another small coastal storm system southeast of Cape Cod is expected to bring widespread cloud cover to much of the Northeast U.S. with some spotty light rain and drizzle, chiefly over central and southern New England. A cold front covering central Montana to northern California will bring varying amounts of cloudiness to the Rockies, along with spotty precipitation. But the biggest eye-opener goes to the Desert Southwest, where an unusually vigorous upper level low-pressure system centered over Arizona will bring everything from patchy high clouds to localized heavy downpours and thundery weather. This will be especially true over parts of New Mexico, where as much as 0.5 inches (1.27 centimeters) of rain is forecast. That's a surprise, since much of the state typically receives about that amount of rain in the entire month of May, which is one of the clearest and driest times of year in this part of the country. This weather pattern, in fact, is more typical of midsummer — the so-called monsoon season. Which only proves that the late science-fiction writer Robert Heinlein was correct when he said, "Climate is what you expect, but weather is what you get!" And even if the weather is bad in your area, you can still watch the meteor shower, which is spawned by debris shed by Comet 209P/LINEAR, live online. The Slooh community is hosting live views of the shower beginning at 11 p.m. EDT (0300 May 24 GMT) and will also stream a webcast about Comet 209P/LINEAR before that, at 6 p.m. EDT (2200 GMT). Watch the webcasts directly at Slooh.com, or catch the Slooh meteor shower feed on Space.com. 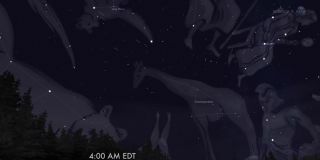 The Virtual Telescope Project will also host a Camelopardalid meteor shower webcast.